This weekend Shannon and Mike went to North Carolina to look for a place to live—they’re moving the end of December, and how we’ll miss them! 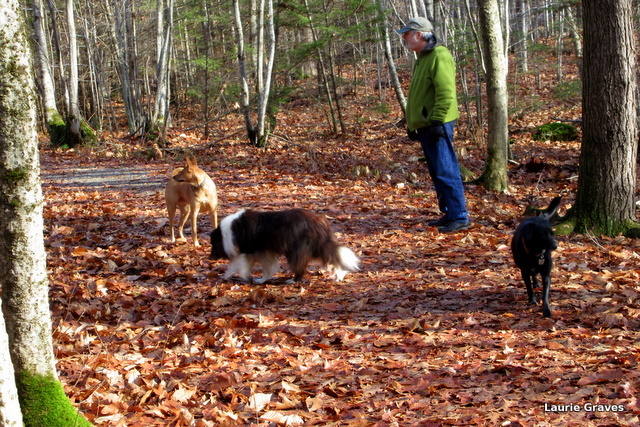 Therefore, Clif and I took care of Shannon and Mike’s dogs, Holly and Somara, while they were away. 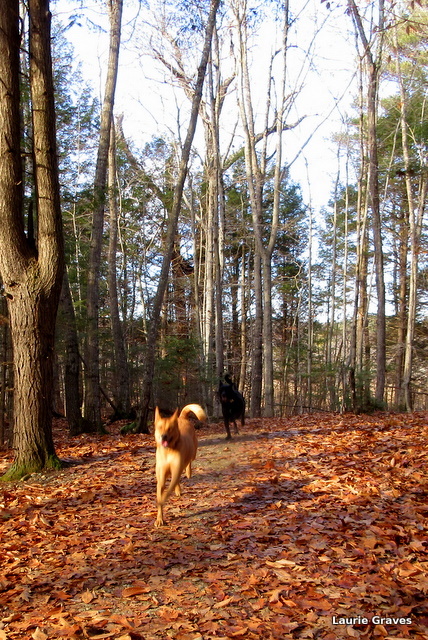 Each day, into the woods we went so the dogs could sniff and run and play. How lucky for us to have such beautiful trails so close by. 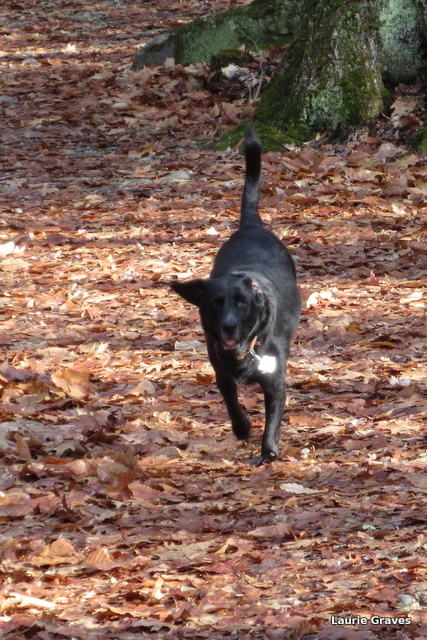 And, I must admit, even though it is freakishly warm for December in Maine—in the fifties, no less—I was grateful to have bare trails for our doggy romps. Shannon and Mike aren’t the only ones we’ll miss. We’ll miss those dogs, too. Thanks for watching our girls and glad they were good for you!! As excited as we are for this move – will miss being near you guys a lot!! And the girls will too – they love coming to visit you!! North Carolina is a NICE place to visit. Our son & family lived in Raleigh for nearly 20 years so we’ve had many walks, sites to visit, etc. Trails include some of the Green Trail which starts here in Maine. Also Duke Gardens is a MUST see if possible. 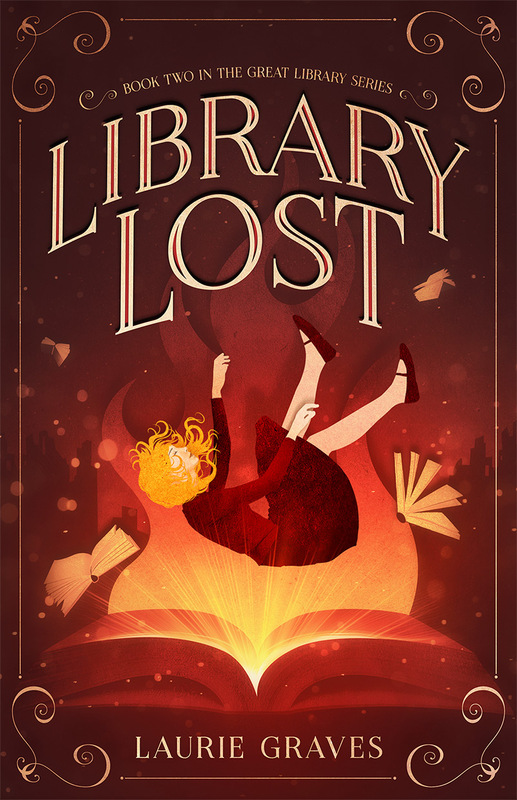 Yes, it’s a long ways away – but it will be a new adventure for all of you. Do you know what area of NC yet? Pearl, they will be living in Chapel Hill. And thanks for all the tips! Chapel Hill is a lovely area!!! You will enjoy visiting there. So great how the granddogs are part of the family. Our Riley might not be quite so welcoming to others. LOVE the pic of the two faces at the exact same angle (waiting for treats)! Such a bright picture, isn’t it? And, yes, how nice the dogs all get along. Thanks so much, Johanna, for your kind understanding. 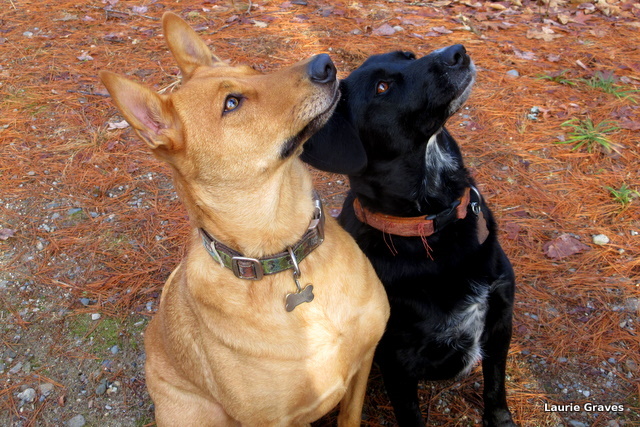 I love the post title and the shot of the two expectant pup faces waiting for their treats. Sad for you that they’re moving, but NC is a drive-able distance and a good place to visit. Also, it could be worse. Our daughter just moved from NC to Cal.–much farther away! Oh, yes! So much farther away! Yes, the look on the pup faces is so bright. I got the shot at just the right time.